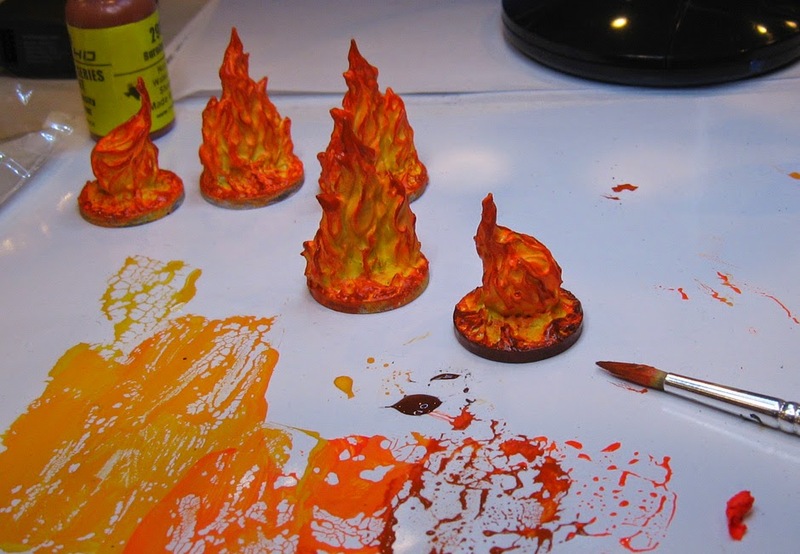 James Wappel Miniature Painting: Turning water into fire!!! Yes folks, it's true! 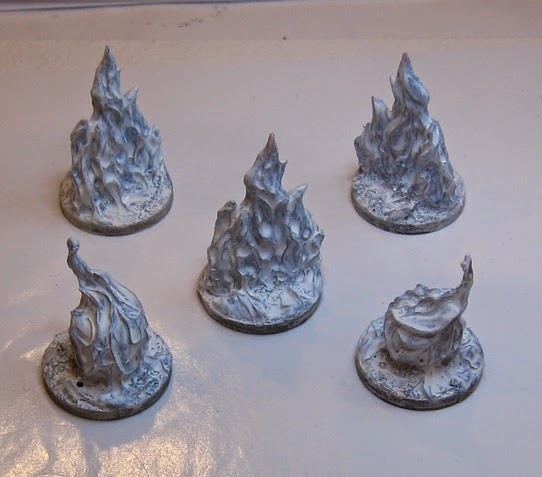 You can make fire from water! 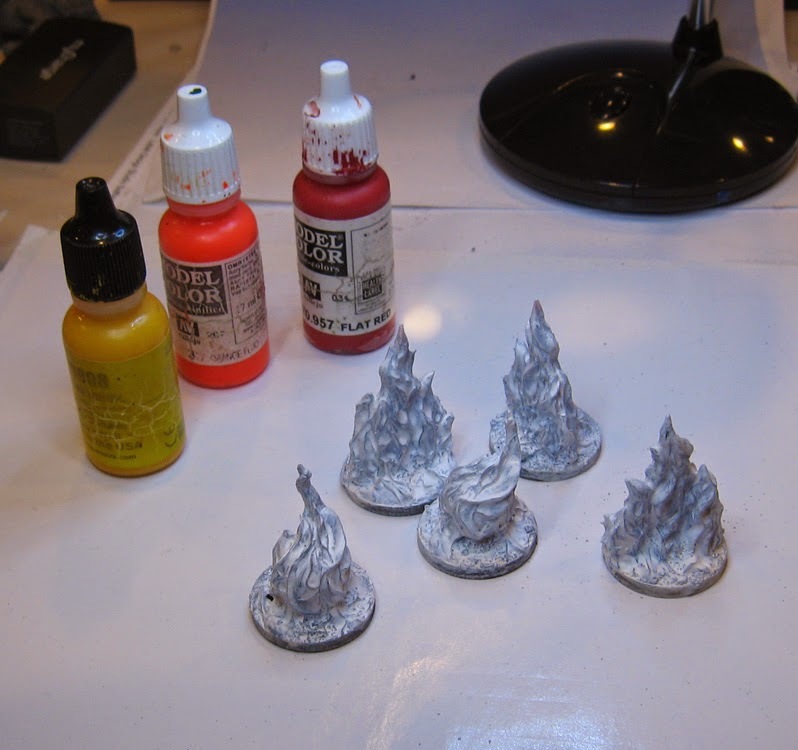 All you need is a brush and some Vallejo Water Effects. Like all the Vallejo gesso products, it has quite a bit of body, and literally stands up on its own. 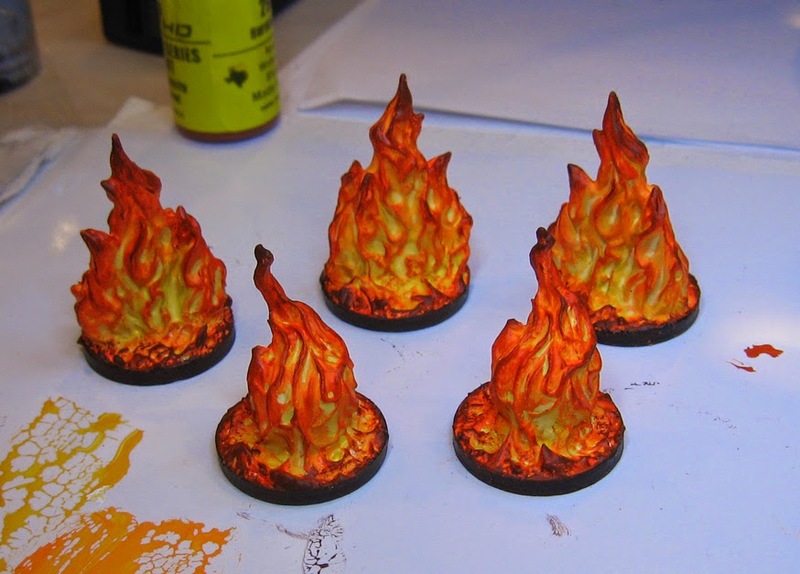 I had a number of Reaper BONES fire miniatures that I wanted to use a fire markers in various games, such as Flames of War and Wild West Exodus. 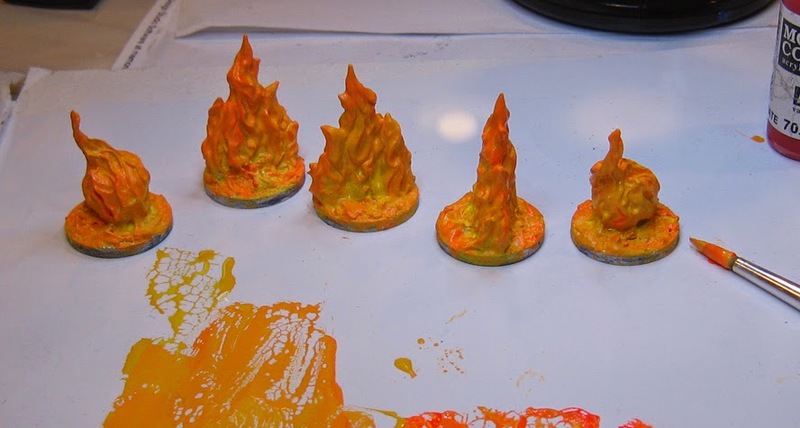 Just using the flames themselves had little appeal to me, but trying to sculpt a bunch of extra flames to juice them up had even less appeal. 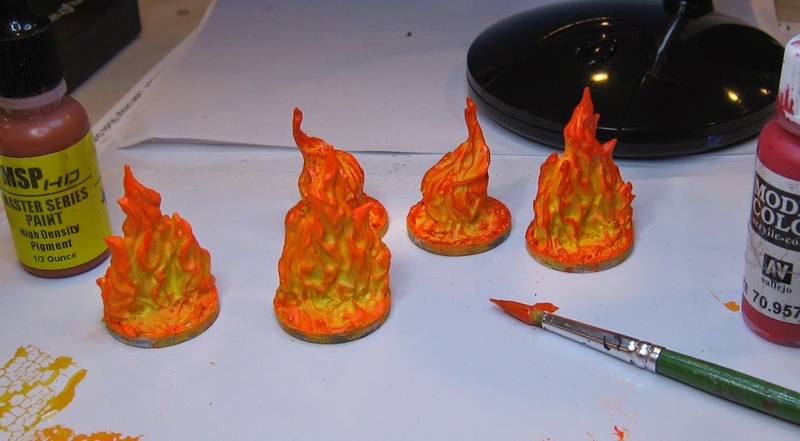 For some reason, the thought crossed my mind that using water effects gesso might actually make passable flames. 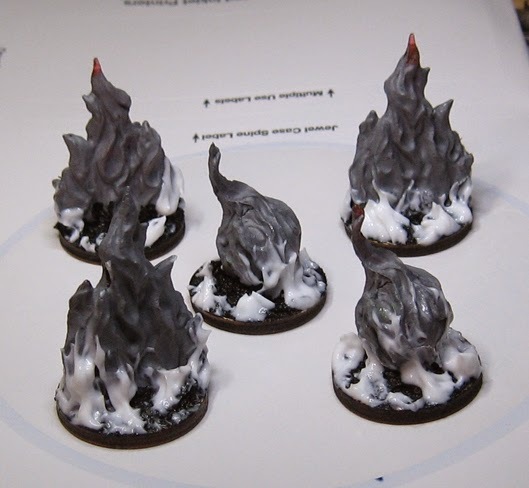 I started out by putting the black lava around the flames at the base to create embers. 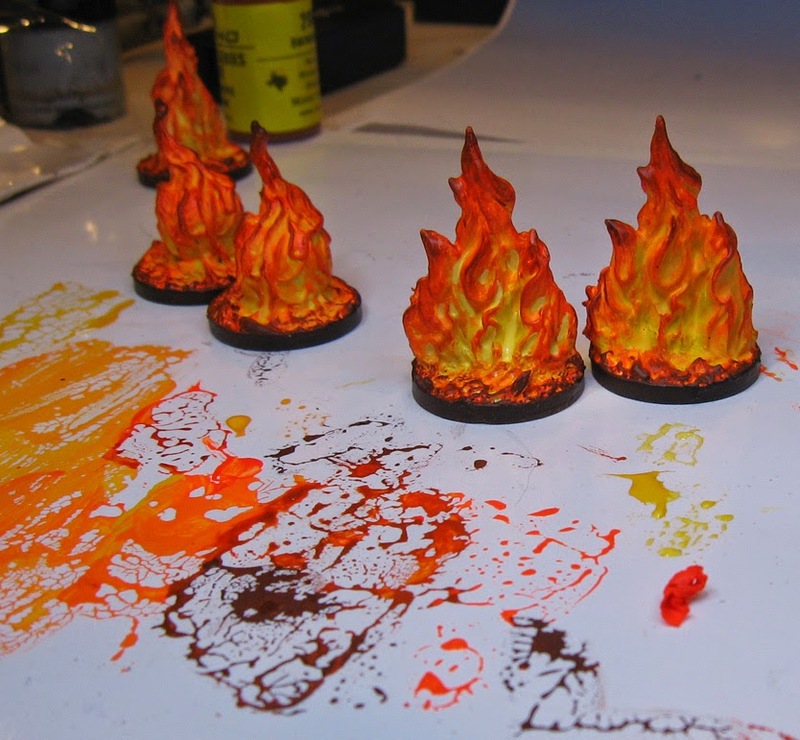 Then I started to build up the flames using the all purpose craft brushes. 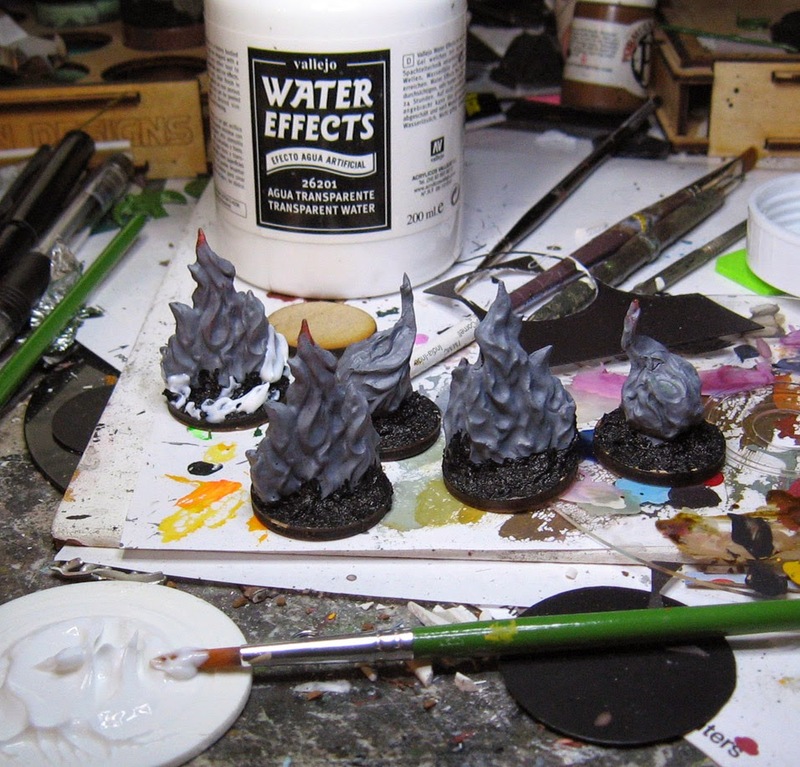 All you have to do is plop down some water effects, and then 'pull' it off to the side, twisting the brush along the way. 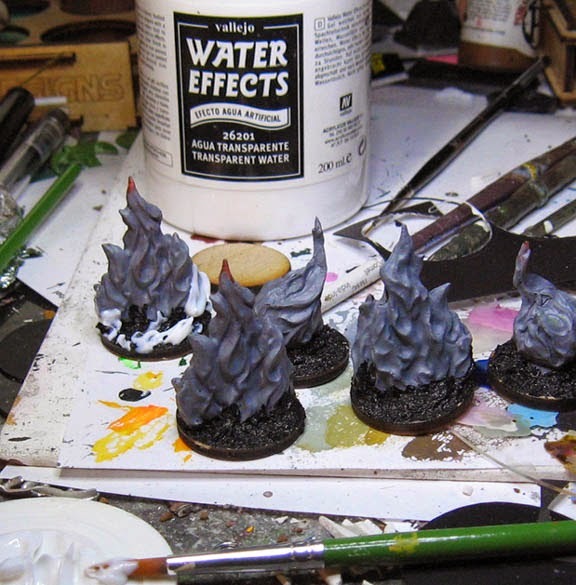 I even carried the effect up the side of the miniature itself! And, there was no 'collapse' of the material. Every flame was just the way I left it hours later. I started with a white/yellow mix at the base. Each layer meant more of the fluorescent orange. 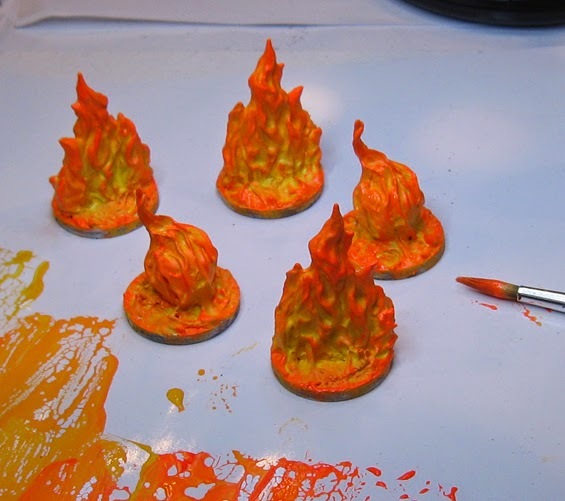 I didn't drybrush this. I used flow improver to thin down the fluorescent paint, which despite its transparent nature, is quite thick. At this point I began to introduce a bit of burnt orange to the mix. 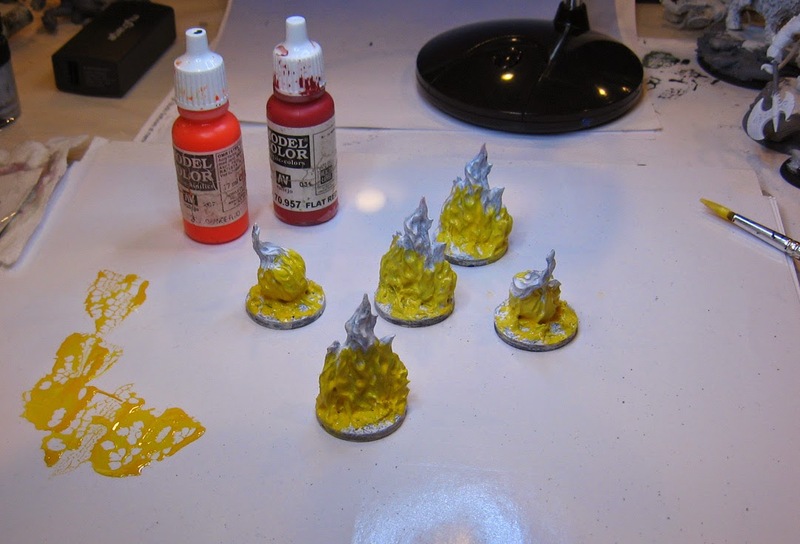 If the previous layers were still wet, that was fine, as I took advantage of that situation to do some wet blending. Each layer was more of the burnt umber color, which you see on the left. I added a reddish black to the mix for some of the final layers. You can see the difference that it makes already. 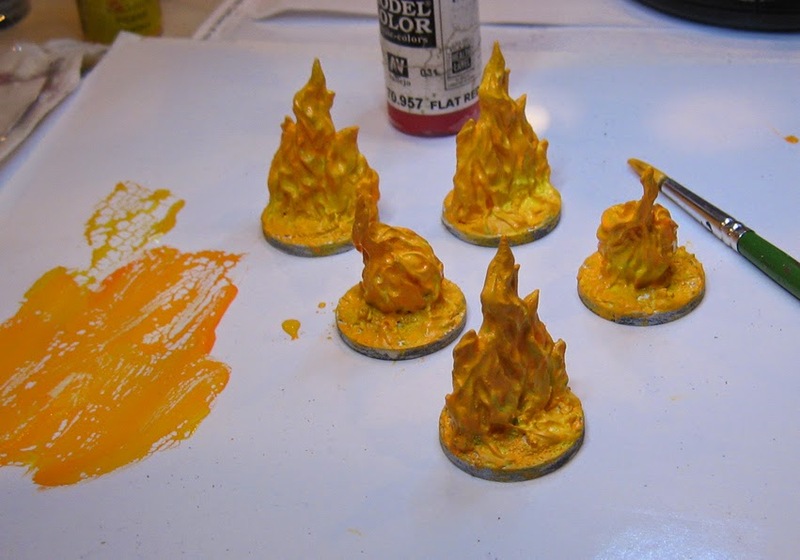 I then went back in with a white/yellow/fluorescent yellow mix to enhance the brightness at the base of the flames. These will be fantastic for just about any game system, and they really took no time at all. I am going to use this method from now on, and I intend to use it on a tin of stuff! 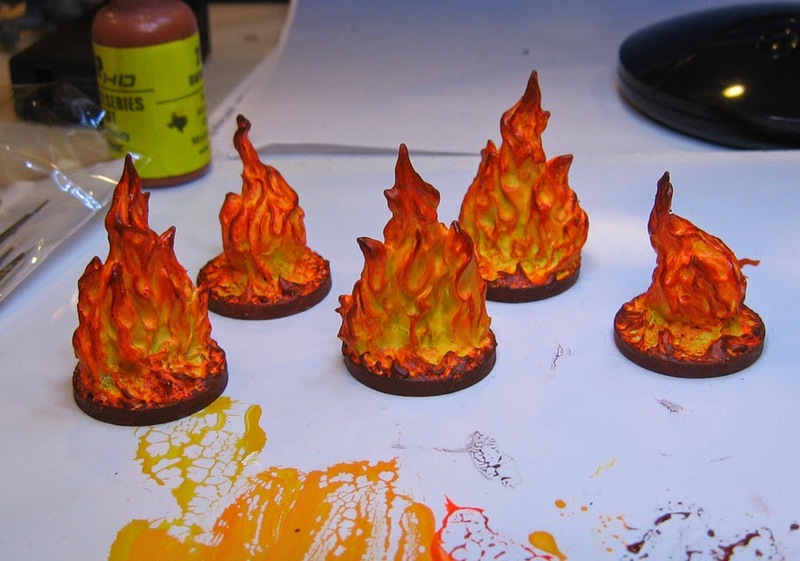 I will make flamethrower tanks for Pacific Theatre in Memoir '44, flame effects on my Warrior Nation WWX minis, 40k, WFB weapons, and much much more!!! You never stop amazing us! And for free!!! Thank you. I am loving mixing the fluorescents with regular paints! Just did ice white and yellow on a mini. 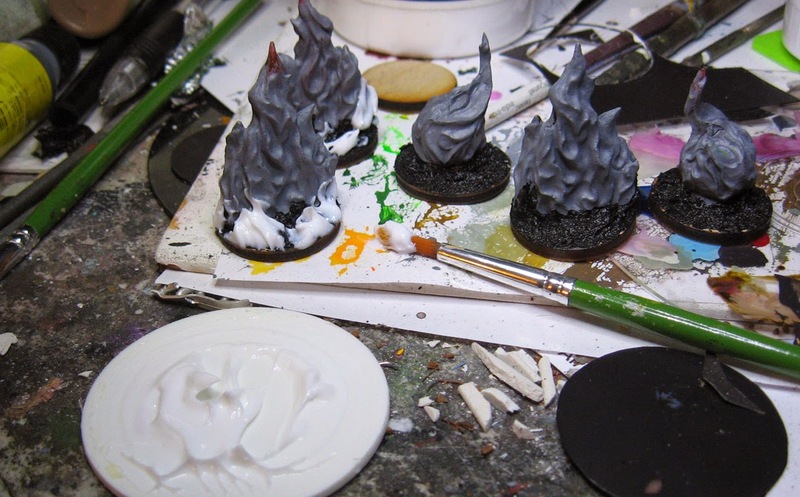 One of the never ending tips in the painting vids.